my parents came home (to iowa) from china for a two-month break this Christmas season. 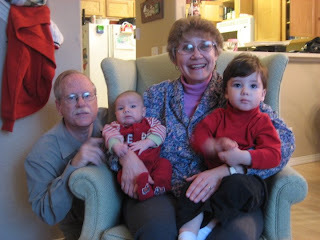 they came out to stay with us for a week, arriving the sunday after Christmas. while they were here the weather was absolutely gorgeous, reaching 63 degrees one day - a welcome break from the blizzards they had been experiencing in iowa. we got to play outside every day! harrison really loved having two more people around the house to play with him all day long! jeremy and i were concerned that he might not speak to them - or speak at all - because he is normally not as verbal with anyone other than mom & dad. 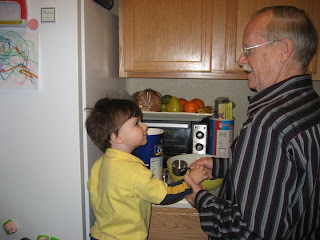 but he surprised us by being instantly accepting of grandma & grandpa...and VERY chatty! on new year's day we made a big meal and invited jer's side of the family to join us. 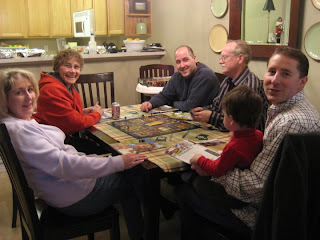 we always play games after holiday meals. "clue" is one of the favorites. i'm always "miss scarlet" (not only because of my black hair, but because she gets to go first every time. it's true...read the rules). and jer's mom is always "mrs. white". harrison helped my dad make his famous apple muffins. 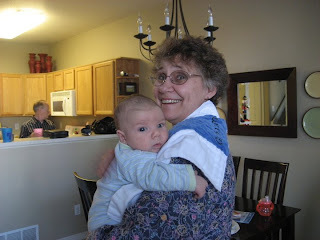 grandma loved getting to hold graham. and, boy, did he love being held! thanks for visiting. can't wait to see you again this summer! i am a wife and a mama. i'm a homemaker and a former homeschooler. i avoid dishes at all costs. i long for a clean and quiet house, an empty laundry hamper and to just once finish a cup of coffee without having to reheat it. but even though those wishes rarely come true, i love my life and wouldn't change a thing. looking to read about our journey with Sensory Processing Disorder? Click the spd link below. it's a happy new year!